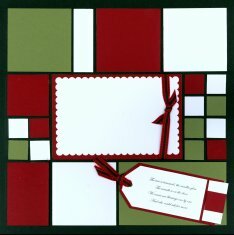 Mosaic Scrapbook Pagekits are a great way to add interest to your Scrapbook Layouts. 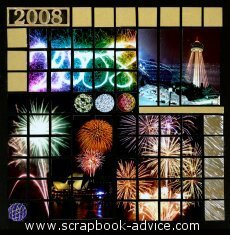 These particular page kits that I purchased from Tami Potter of Wish in the Wind have worked great for my Fireworks photos - particularly the ones that don't always turn out perfect. You know those photos where only part of the photo is in focus, or only part of the photo really captured what you wanted. 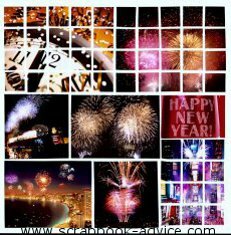 A Video on how to do Photo Mosaics is at the bottom of this page. With Tami's Mosaic Scrapbook Pagekits, I was able to very quickly cut my photos (yes, these are really cut into one inch squares) and lay out the best parts into a great layout that has all the pieces pretty straight and even. The Mosaic process for cutting photos became popular a number of years ago and I tried it, but it was very difficult to cut and lay the photos pieces down evenly. Then there were some die-cuts that we could purchase to lay over the photos, but then they covered up some some the actual photo and they were also difficult to work with. Tami's system for Mosaic Scrapbook Layouts and the Mosaic Page Kits that I discovered at the Scrapbook Expo in Atlanta, Ga in July 2008 has solved all of those problems. To see more of the Yellowstone Scrapbook, click on the pictures. 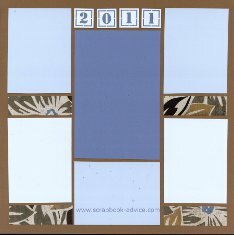 Here are two layouts using Mosaic Scrapbook Pagekits that I picked up in a Class at the CK Convention in Charlotte, NC in August 2011. I always try to take one or two of Tami Potter's classes when I can. In this class we made some patterned paper from some of the stamps that Tami sells, and used that for some of the inset pieces around the photo mattes. To some of the solid pieces, I added stickers of the flowers at Yellowstone. 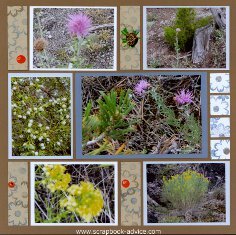 I thought the photos of the flowers I took very important as they were all growing in the midst of rock, steam and the chemicals that were coming from the steam vents, geysers, mud pots and fumeroles. 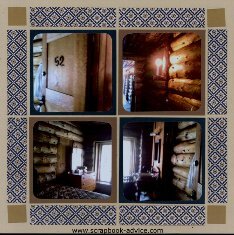 Here are a couple of Mosaic Scrapbook Layouts I did using one of Tami's Mosaic Scrapbook Pagekits the I picked up at the July 08 Expo. 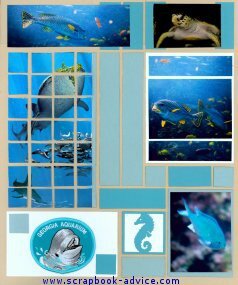 For the page on the left, I was able to use the brochure from the Atlanta Aquarium and cut it in the mosaic tiles like I learned at the Expo. I brought a couple of extra with me in case I made a mistake, but the system was so easy, I didn't need them. I used another part of the brochure and cut it on the curve using my craft knife for the right hand page. The two embellishments of the sea horse and the crab (called corner stones) came with the Mosaic Scrapbook Pagekit, as did all the pieces and background cardstock already pre-cut. I just laid the pieces down on the cardstock to match the picture on the outside of the package. Except for trimming my photos and I didn't even need scissors to put the basic kit together. 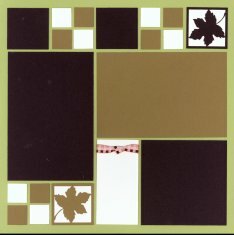 Click here to visit Snapncrop.com (Wish in the Wind, LLC) to purchase Tammy's layouts and products. 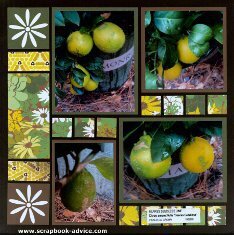 For these particular Mosaic Scrapbook Layouts, I used only Tami's Grid Paper in a bright yellow. The Grid Paper is the key to this system and it comes in many different colors and sizes. 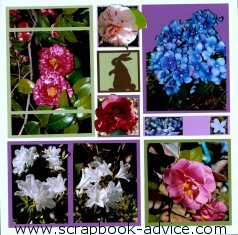 Each of my floral photos from the yard this spring were cut into the one inch squares using Tami's Mosaic Grid System with a cutting surface, temporary adhesive, a metal ruler and craft knife. 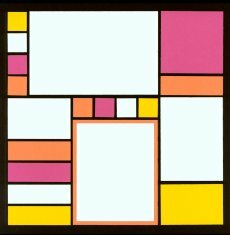 Each square was then aligned onto the Grid Paper. 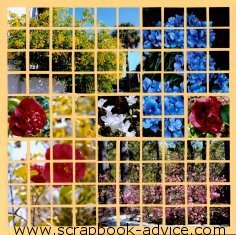 If you look carefully at this Mosaic Scrapbook Layout, however, you will see that there are three small photos on each page that were left without cutting and these have each been arranged into a pattern of uncut photos. 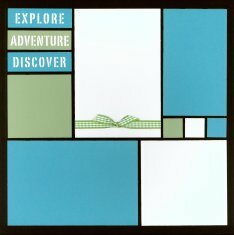 Here are two layouts from a Mosaic Scrapbook Pagekit called Adventure. All the pieces that you see here came with the kit. 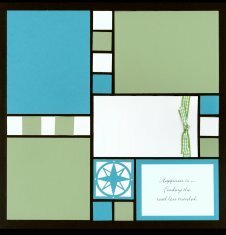 The Corner stone of the compass rose was included in the Mosaic Page Kit, as were the journaling cut outs and the green and white gingham ribbon. There is also a journaling block included that says "Happiness is finding the Road Less Traveled." A sentiment that can be used for many occasions or not used at all. You can always turn the sentiment on the back and write your own, rubber stamp it, or use it for a photo or embellishment matte. 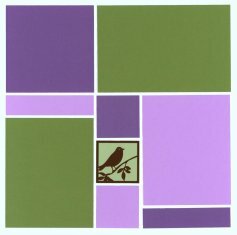 This next Mosaic Page Kit, called Mother Nature, has the greens and lavenders on a white background. 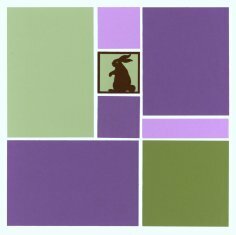 Included in the Mosaic Page Kit were the corner stones of the rabbit and a bird on a branch in dark brown. 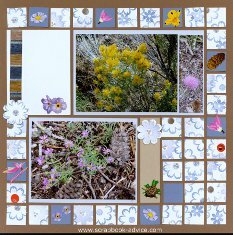 In the next 2 graphic images, I have used this Mother Nature kit for some more floral photos so you can see how it looks when finished either with whole photos, mosaic cut photos, or a combination of both. 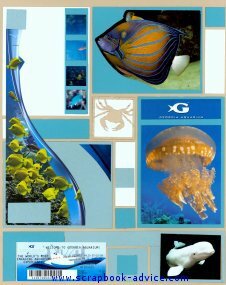 This is the same Mosaic Scrapbook Pagekit, Mother Nature, as shown above, but with the photos cut and mounted on the page kit. While I kept the photos of the Blue Hydrangea intact, I did cut around the top of the flowers to allow the color of the matte to be seen. 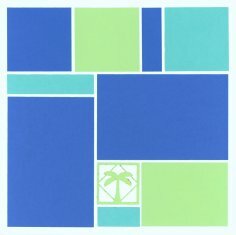 This next one of the Mosaic Scrapbook Pagekits is called Royal Palms. 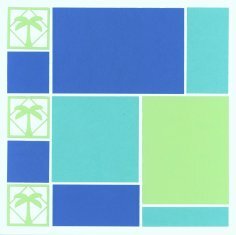 This would be perfect for any beach layout or vacation layout to an island resort area. 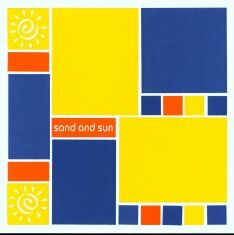 Here are two more great layouts from Tami Potter's Mosaic Moments collection that make great beach or summer-time layouts. 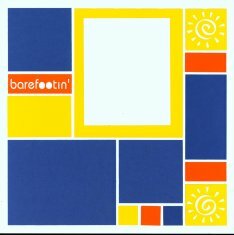 With the die cut phrases that say "Barefooten" and "Sand and Sun" and the four yellow sun shaped cornerstones, these color blocked layouts depict fun even before the photos go on. 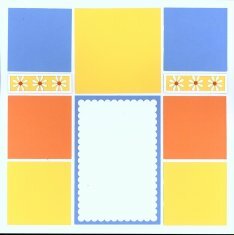 Here are some completed page kits from the set called "Daisy'd". The kit with out photos is shown above and was done shortly after I received it. 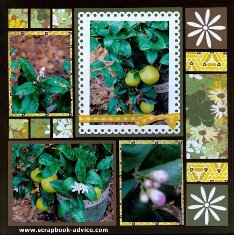 I thought my photos of my new Lemon & Lime trees went nicely with the colors in the papers, so completing the layouts took only about 5 miniutes. This Mosaic Scrapbook Page kit is called Daisy Love. 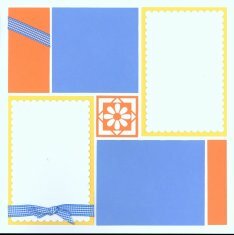 This one uses the scalloped photo mats, two yellow Daisy shaped Die Cuts stripes with orange brads, one orange daisy shaped cornerstone and beautifully matched blue gingham ribbon. 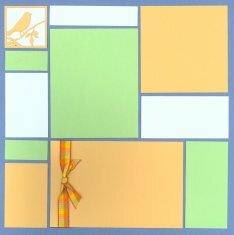 This Mosaic Scrapbook Pagekits is called Song to Sing and features a Yellow Cornerstone with a bird on a branch, some pretty orange, green and yellow ribbon to match the cardstock colors, and watering can charm and a journaling box that says "I wish for you a song to sing and a smile to share." 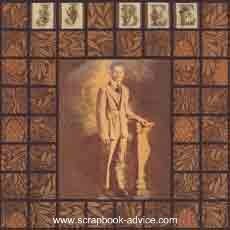 This Mosaic Scrapbook Pagekit is called Slumber Party. It uses the 5 corner stones on the left, a journaling tag, a year date (mine was 2008) and a piece of really pretty pink, orange and yellow ribbon to use on the tag. The journaling says "Slumber parties, aren't they great? Eat popcorn and stay up late. Play a game of truth or dare, Better hide your underwear!" 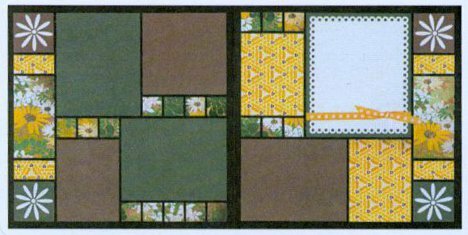 What a great rhyme for a slumber party layout, but if you are past the age of slumber parties, what a beautiful Mosaic Page Kit layout for anything spring or girlish. 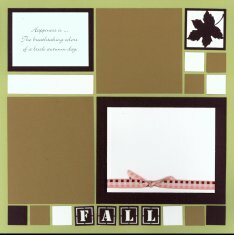 This next of the Mosaic Scrapbook Pagekits is titled Fall uses 3 Leaf cornerstones, F A L L die cut letters cut from the 1 inch squares, pretty ribbon and a Journaling Block that says: Happiness is... the breathtaking colors of a brisk autumn day." This would make a great kit for photos of the trees turning their leaves in the vibrant colors. The subtle card stock used here will not interfere with the colors in your photos. These three Mosaic Scrapbook Pagekits were from a class I took at the CK Convention in Charlotte, NC in August 2011 and focused on using patterned paper for some of the elements on the pages. I used some photos of the Old Faithful Inn on the first of these layouts. 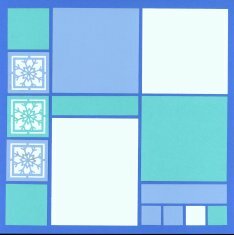 If you look closely, the first one has space for 4 photos with the patterned paper around the outside, the next has room for 5 photos in a sort of pinwheel design, the third has room for 6 photos in a sort of 3-column layout with patterned papers filling in the blank spaces. 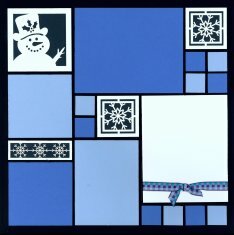 This next one of the Mosaic Scrapbook Pagekits is titled Snowy Day with 3 snowflake corner stones in 2 different colors and a forth corner stone showing a snowman. 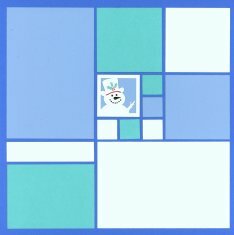 I have added my own color behind the cut out pieces in the snowman with black card stock behind the eyes and smile, orange card stock for the carrot nose, and red and green behind the holly in his hat. I never would have thought of using light green with snow photos, but it's really a perfect set of colors for any winter day photos. 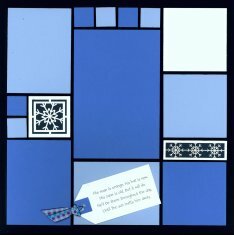 This next one of the Mosaic Scrapbook Pagekits is titled Winter Fun and uses the same Snowman corner, and the 3 snowflake corner stones but backed by a darker blue. Additionally there are 2 snowflake die cut strips, blue and silver ribbon and a journaling tag. The journaling tag says: "His nose is orange, his hat is new, His cane is old, but it will do. He'll be there throughout the day, Until the sun melts him away. What a great Mosaic Page Kit layout to use for those first snow days and the fun of making a snowman! 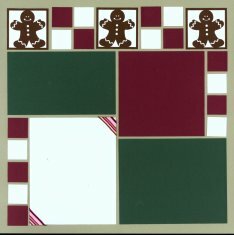 This next one of the Mosaic Scrapbook Pagekits is called Christmas Goodies comes with 3 Die Cut Gingerbread Men used with red and white one inch squares to make a top border. This kit also comes with a scalloped and die cut photo matte, Red & White candy striped ribbon and a Gingerbread Man charm. What a great layout to use for photos of cooking up some Christmas cookies - Gingerbread Men, of course - or making one of those wonderful Holiday Gingerbread Houses. 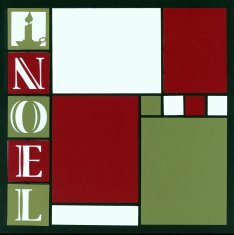 This next one of the Mosaic Scrapbook Pagekits I am calling Noel comes with the die cut letters spelling out NOEL along with Cornerstone of a Christmas candle that form to make a border on the side of the page. 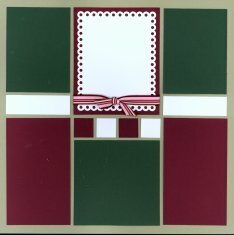 Other additions to the page kit are the white scalloped photo matte, the red and green Christmas ribbon and the Journaling Tag that says: "The tree is trimmed, the candles glow, the wreath is on the door. We count our blessings one by one, And who could ask for more? 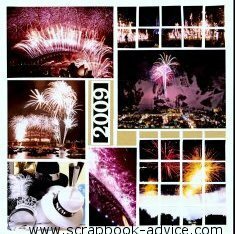 Last but not least in the review of Mosaic Scrapbook Pagekits is the 2009 New Years Eve layout of various fireworks shots. Some of these photos have been cut into mosaics and some have not. The choice is yours. 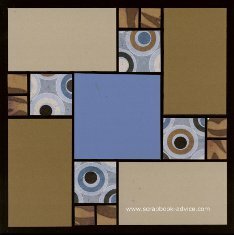 I hope you have enjoyed looking at these Mosaic Scrapbook Pagekits as much as I enjoyed putting them together and using them. 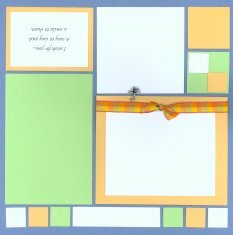 Tami Potter's Mosaic Grid System is great and very easy to use with a lot of pre-made kits and Grid Paper options for colors and sizes. I can tell you first hand that her system is very easy to learn and use. 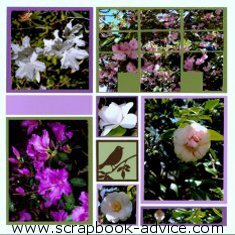 As you can see, these page kits can be used for any seasonal photos from New Year, through Spring and Summer, on to Fall and into the Holidays. This layout below is one I did years ago of my grandfather. 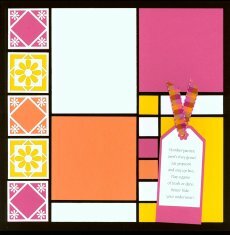 All the other layouts on this web page were done using Tami Potters Mosaic Grid System in less time than it took to complete this one page layout. 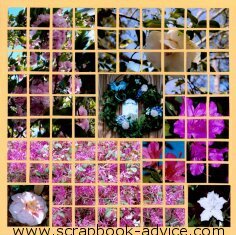 Check out this video for a quick review of how to do these photo mosaics from Tami herself. This really is as easy as it looks. 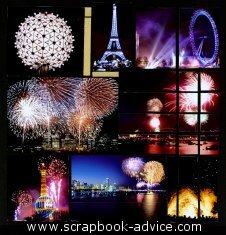 Check out our Scrapbook Tutorials for more great ideas.